“The Palladio Awards honor outstanding achievement in traditional design. The program recognizes both individual designers and design teams whose work enhances the beauty and humane qualities of the built environment, through creative interpretation or adaptation of design principles, developed through 2,500 years of the Western architectural tradition. The Palladio Awards are the first and only national awards program for residential and commercial/ institutional projects which demonstrate excellence in traditional design. 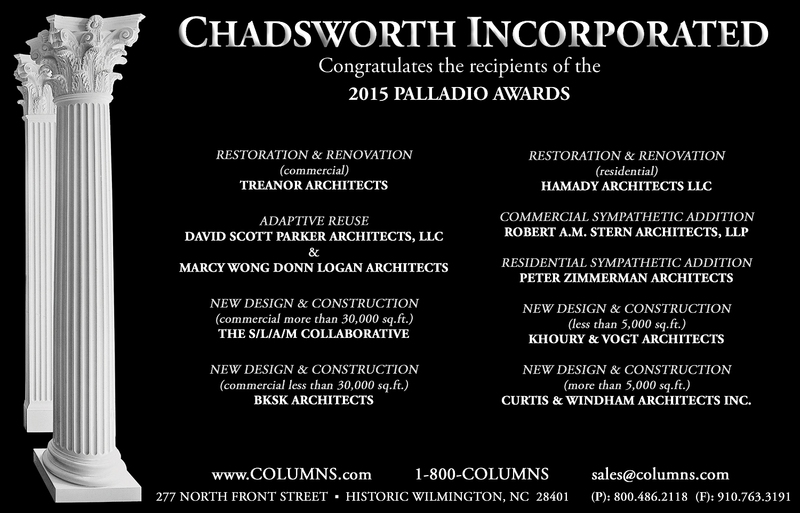 Chadsworth Columns congratulates all of the winners of the 2015 Palladio Awards. This entry was posted in CLASSICIST / ICAA, FOR THE PRESS, HAPPENING NOW and tagged chadsworth columns, Chadsworth's 1.800.COLUMNS, classical architecture, Commercial Construction, Palladio Awards, Period Homes, Renovation, Residential Construction, Restoration, Traditional Building by Chadsworth Columns. Bookmark the permalink.